In August, Rachel Roy launched a pop-up store on Facebook. The insider shopping event gave the brand’s Facebook fans early access to Roy’s new jewelry line — a collaboration with British R&B artist Estelle. The pop-up store, which lasted three days, boosted Rachel Roy’s fan base by 25% in the first day and 100% by the end of the campaign. The Facebook Page was acquiring 1 fan every 1.5 seconds. The collection featured an exclusive, limited edition piece that sold out in only six hours. The Rachel Roy pop-up shop was built on a software-as-a-service solution created by Fluid Social Fan Shop. Peter Goldie, the vice president of marketing at Fluid Agency, an ecommerce firm whose clients include Diane von Furstenberg, Nine West, Theory, Vans and Coach, believes that retailers need to create engaging social merchandising experiences that increase a brand’s fan base while driving transactions. “Marketers are always looking for ways to drive customer purchases,” Goldie said. “Having limited edition, time sensitive sales helps retailers drive sales without having to discount.” Goldie added that pop-up shops are a great way for brand manufacturers to test the ecommerce waters without going into full-scale website development. In August 2010, Philadelphia-based Kembrel launched a private shopping community for students that sells clothing, books and computer gadgets at 40-75% off — and they did it entirely via Facebook. Kembrel’s summer beta period successfully attracted more than 20,0000 registered student members. This initial growth was mostly organic through word of mouth, with little reliance on traditional marketing. “The total market is 17 million students and every year, they spend over $300 billion. Now two-thirds of that $300 billion dollars [goes toward] school, housing, food and essentials; there’s $100 billion dollars spent on apparel, shoes and accessories and that’s the market we’re going after,” said Cherif Habib, Kembrel’s CEO. What makes Kembrel’s private sale model unique is that the marketing strategy completely relies on the social behavior of participating college students to drive consumption. The product assortment is tightly curated by young buyers who understand the student market. The day-to-day student activities are also student-run. To date, there are also more than 250 brands that have signed up to reach students through the Kembrel platform. “College students spend two to there hours a day on Facebook. By bringing our store to where our customers spend the most time online, our goal is to provide them with the most convenient and relevant shopping experience,” Habib said. Kembrel is taking student relevance a step further by launching an internship matching service for fashion students who sign up for the site, connecting the shopping experience to the community. 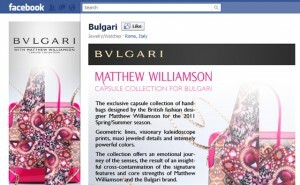 Luxury retailers are starting to explore Facebook as a revenue channel as well. In February, Bulgari launched a wishlist feature via Wishpot, a universal wishlist and registry service that lets retailers save things from stores all around the web as well as on Facebook. Bulgari fans can also purchase select jewelry through the app. Staiman believes that luxury brands should be looking at Facebook to offer diffusion lines while keeping the integrity of their brand sound through unique Facebook Pages. Developing a presence with interactive components is key. Are you a small- to medium-sized retailer that wants to set up shop on Facebook on a shoestring budget? Well, San Francisco-based Payvment has created a solution for you — and it’s free. The company’s software allows retailers to create Facebook storefronts that accept payments via credit cards and PayPal. Payvment’s ecommerce Facebook app allows anyone with a retail store to set up shop on Facebook and create a compelling storefront, complete with discount offers, incentive programs, and the ability for customers to complete their purchases within Facebook. The app even prompts buyers to become a fan of a store in order to receive exclusive deals. The app offers unique features for shoppers as well, allowing them to carry their goods with them across thousands of Payvment-powered storefronts on Facebook. According to Payvment’s CEO Christian Taylor, the company was setting up 250 new Facebook retailers each day as of last December, and hosts more than 40,000 with 750,000 items for sale. Notable shops include Grayce By Molly Sims, Yes To Carrots and Cartoon Network’s Adult Swim UK. In fashion, sometimes a retailer has to go big or go home, and that’s exactly what U.K. retailers ASOS and Young British Designers have done. In January, ASOS launched the company’s entire 150,000 product catalog on Facebook in hopes of increasing revenue from mobile commerce, which currently amounts to just $1.5 million, or about 3% of its revenue. Young British Designers launched a fully-integrated Facebook store a few hours after the ASOS store went live. Both stores allow consumers to buy designer items, search products, add items to their basket, edit cart contents and check out securely. Both have also have integrated social shopping features. Customers can “Like” items and share and tweet products that they purchase. A third retailer, Tesco Clothing, has generated over £2 million (approximately $3.2 million) in sales over the past year through its U.K. Facebook Page. Tesco tracked its activity on Facebook using vouchers, finding that a campaign called “Friday Frenzy” resulted in more sales in two hours than it would usually get in a week. Though successful, Tesco has shut down the Facebook shop due to staffing and budgetary constraints.